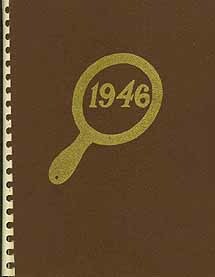 Now everything you wanted to know about the IHS Class of 1946 is at your fingertips....as published in the 1946 Mirror Class History. Lil and Bud have 5 granddaughters, 4 grandsons, 5 step granddaughters, and 3 greatgrandsons. Robert E. VanSteinburg, IHS 1946, age 90 of Ilion, passed away peacefully on Thursday, December 14, 2017, at Alpine Nursing Home in Little Falls. 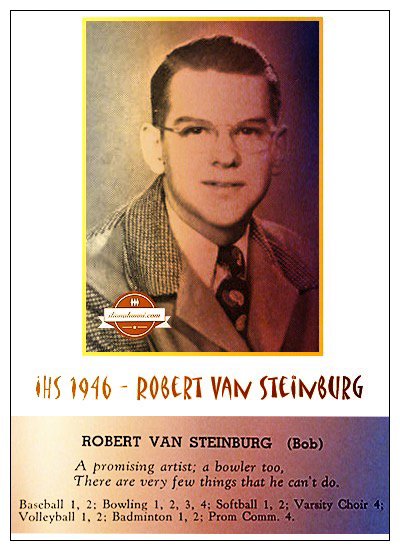 Bob was born on July 19, 1927 in Ilion, NY, the son of the late Clayton and Marjorie (Coleman) VanSteinburg. He was a 1946 graduate of Ilion High School and holds BFA degrees in Painting-Illustration and Art Education from Syracuse University. Bob worked for many years as an art teacher for Mohawk Central School and was also well known in the area as a Commercial Artist and Illustrator. Prior to teaching he was employed with GE, American Emblem and was member of the Army National Guard. "Uncle Bob", as he was known to many around the Mohawk Valley, had a lifelong passion creating his art work. Etched upon his easel were his words of inspiration ~ Focus, Follow-through and Faith. Many of his paintings hang in local homes and throughout the country. His work was commissioned by several national greeting card and publishing companies. He was a member of the Central New York Watercolor Society. He always enjoyed spending time with his sister, brother-in-law and his nieces and nephews. Mary Joan Hammond Eller IHS 1946, age 74, of Pinellas Park, FL, passed away on Friday, June 28, 2002, at Fairfax Hospital. She was born May 13, 1928, in New York City, to the late Brian R. and Margaret Mary (Orr) Hammond. She is survived by husband, Connie L. Eller; eight children, Christopher (Bobbie) Eller, of Woodstock, VA, Margaret (Warren) Farrington, of Pinellas Park, FL, Brian (Lynn) Eller, of Paducah, KY, Jack (Cynthia) Eller, of Herndon, VA, Mike (Cyndi) Eller, of Poolesville, MD, Constance (James) Juno, of McKinney, TX, Mary Jo (John) Kaler, of Ft. Wayne, IN, and Jeffrey (Kellie) Eller, of Garland, TX; as well as 15 grandchildren. Services were held at First Baptist Church in Herndon, VA, on Tuesday, July 2, 2002, at 2:30 p.m. Arrangements by Adams-Green Funeral.